Is an asbestos ceiling dangerous? 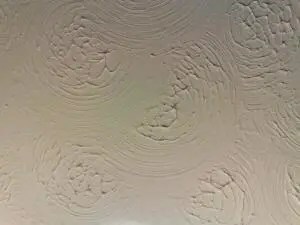 We’re all familiar with artex and textured coating ceilings that were prevalent in the 60’s, 70’s and early 80’s, many of which contained asbestos, but is an asbestos ceiling dangerous? Perhaps you have planned to do some decorating or renovations and you’re concerned about the old asbestos ceiling. Will the ceiling be ok to paint over? Can i drill holes into it? Can it be sanded? These are just a few of the queries you may have. Let us first give you some background information on what an asbestos ceiling is. Spray on textured coatings such as Artex were very popular from the 50’s to the early 80’s. Artex was popular because it was an easy way for builders to hide imperfections due to it’s texture. Up until the mid 1980s, Artex coating was made with white asbestos (chrysotile) which was used to strengthen it. Therefore, it is likely that if your home has an artex ceiling that was installed before that time period, it will most probably contain asbestos. Asbestos was banned in the UK in the year 1999, so any artex coatings applied after then may not contain asbestos. So, is an asbestos ceiling something to be concerned about? Is it dangerous? Well, the asbestos is only harmful when in a powder form, for example if the textured ceiling is being sanded. Providing it is left alone and undamaged it will pose no risk to health. So you won’t be able to drill into a ceiling that contains asbestos or hammer nails into it, but you can paint over it or encapsulate it. Older textured coatings that contain asbestos pose a particularly serious health hazard. If a person inhales microscopic asbestos fibers then it can cause diseases like asbestosis or mesothelioma, which is a cancer of the lining of the lung. There is also a disease called peritoneal mesothelioma which is a cancer of the lining of the abdomen. What if i’m carrying out any works to an asbestos ceiling? We would strongly advise that you seek some professional advice to identify the presence of asbestos if you think you have an asbestos ceiling and you plan on doing any sort of renovations that could disturb it. The Control of Asbestos Regulations 2012 stipulates that only a trained and competent individual can remove the textured coating, and they must wear effective dust proof protective clothing and masks, as well as sealing off the area to be worked on. Most of the time though, this type of removal work falls within exemptions to the licensing requirements which means it does not usually require a licensed contractor. But in high risk situations, the UK regulations state a licensed contractor must be used. Once the artex ceiling has been removed, it needs to be disposed of correctly as hazardous waste. Your local waste management centre run by the council will provide this facility. Although, providing the textured coating is left alone and undamaged, it will be safe to leave the asbestos ceiling in place and make sure it is given an annual inspection. 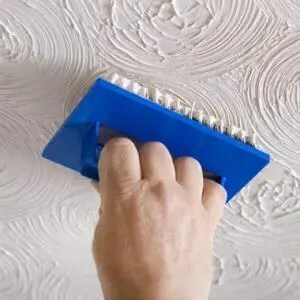 If you’re not planning on doing any renovations to your property, then there is also the option of leaving the textured coating in place and painting it or skimming over it with ordinary multi finish plaster, or a special coating called Artex Ceiling Finish. The ceiling in question should then be labelled in order to warn future occupants or builders of what lurks beneath. Artex should never be drilled into, scraped or dry sanded as this risks releasing asbestos fibers into the air. Did you find this article interesting on Should I be concerned about an asbestos ceiling? Then check out our other interesting articles below. So make sure you contact our Armco office to arrange an asbestos refurbishment survey, before it’s too late!